FILE - President George W. Bush makes remarks on comprehensive immigration reform in the Eisenhower Executive Office Building at the White House compound in Washington, June 26, 2007. Bush and former first lady Laura Bush spoke to about 50 candidates for naturalization during the ceremony at his institute at the George W. Bush Presidential Center. Those becoming citizens at the ceremony came from more than 20 countries around the world. Noting public debate on immigration ``can get pretty sharp,'' he told them that they signed up with a ``boisterous democracy.'' He encouraged them to participate in it and vote. 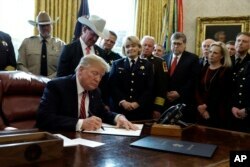 FILE - President Donald Trump signs the first veto of his presidency in the Oval Office of the White House, March 15, 2019, in Washington. Trump issued the veto to protect his emergency declaration for border wall funding. Bush did not mention President Donald Trump by name, but his words stood in contrast to his fellow Republican's fiery rhetoric about immigrants. Last week, Trump used the first veto of his presidency to overturn a measure Congress passed that would have overturned his emergency declaration to build a wall along the southern border — a centerpiece of his successful presidential campaign.